The Coach House is set in spacious grounds of approximately 2 acres with a large 12m x 6m swimming pool. 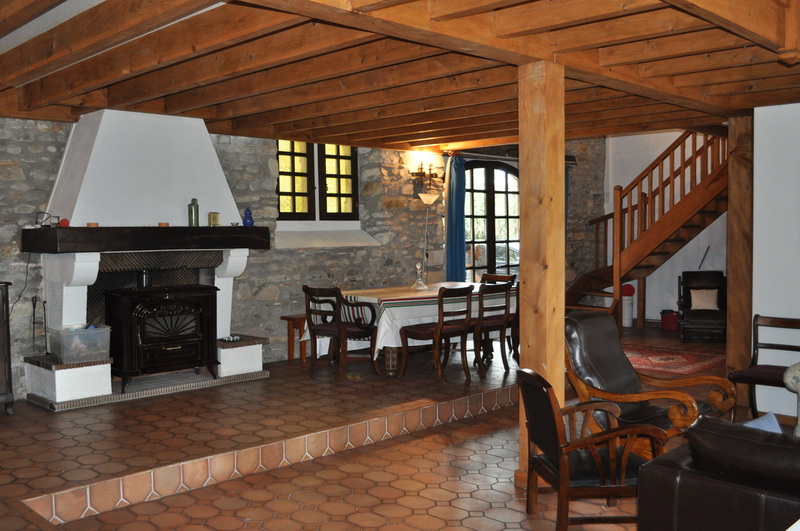 It has traditional stone walls, a carved stone and tile fireplace with wood burning stove and views of both front and rear gardens at Le Pehau and of the village of Osserain. Inside you will find a fully equipped kitchen with full size cooker, fridge/freezer, dish washer and microwave plus a good supply of large modern cooking utensils. Baby cots are available if needed as are high chairs. A baby bottle sterilizer can also be provided. The open plan salon has a comfortable seating area and a large dining area all focusing around the grand fireplace. There is an en-suite double bedroom on the ground floor which is suitable for handicap access. On the upper floor an open plan mezzanine provides wonderful views of the salon below. There are four double/twin bedrooms with a family bathroom and WC plus a washing machine.